It’s time I told you about my latest big adventure. Big in a sense that it enriched my professional life. A couple of months ago I applied for a business contest. It was a local initiative supporting new creative businesses. Together with other 21 wonderful entrepreneurs and their teams we made it through to the last stage after a very careful selection. Several weeks of trainings, workshops and integration events were offered to us as a preincubation process. The trainings included such aspects as social media, e-commerce, marketing, finance, accountancy, business model canvas, creative solutions, effective presentations, among others. To my surprise, the group turned out to be extremely friendly and not competitive at all. Moreover, we started to help each other by sharing useful information one may need to run their specific business. It’s worth mentioning that we had a pleasure to work with very experienced trainers, many of them being actually entrepreneurs themselves. So when the workshops finally finished, it was high time to work on our business models. I remember how sad I felt because I knew something was coming to an end. It was an end to a great chapter of my professional life where we had loads of fun with the group. So now is the time to start serious hard work on the projects. No excuses! Time to act. Working on my business model helped me realize all the gaps and what was still missing in my plan. Good business exercise, I have to say. I spent a lot of time thinking on it and planning the strategy. It’s not easy when you are doing something for the first time 😉 But I love to learn new things so it was a great opportunity for me to grow. After we sent our business models for evaluation, there was one more task to be performed: a creative presentation. I spent 3 days designing the slide deck, preparing infographics, reasearching data and adequate images, and practicing my speech. No special effects though (such as people jumping around or kids playing with my product – these were applied by my competition ;)). I did very well in the morning while pitching in front of the jury but I didn’t expect to be chosen as one of the 5 finalists at the end. The reason being my project was very much different from all the others (I’m building an online social platform while others are doing more tangible business, such as carpets, bags, apparel or coffins – yes, you heard me :)). But I made it. I pitched and said everything I wanted to say. 3 minutes is not much to present the whole idea of your project nevertheless if you focus on the main aspects you’re able to explain what it’s all about. I got the 4th place. Which is absolutely AWESOME. The jury said everything was well thought and planned but the project is in its early phase (agreed!). It made me really happy and gave a boost to continue my work. I know that thanks to hard work and patience I will be successful one day. It is just the beginning of my start-up journey. 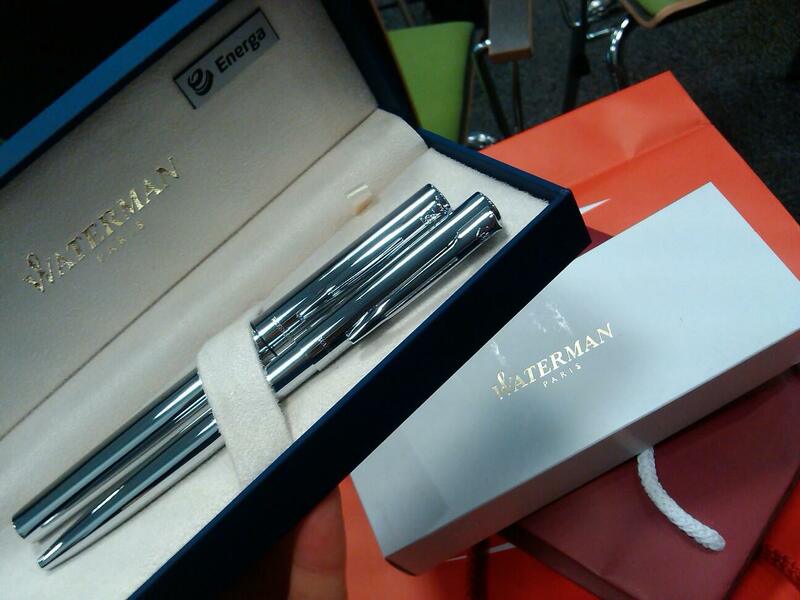 As a reward, I got Waterman pens (see the picture above), 8 business English classes and accountancy services for 2 months. I’d like to tell you one thing. I got my prize earlier than that: it was the knowledge gained during the workshops and trainings, contacts and relationships I managed to build throughout all these weeks. This is something I value more than anything else. And this is the main reason why I wanted to take part in this competition.